Stephen Glassman, sculptor. LNR Warner Center, Woodland Hills, CA, dedicated June 2009. 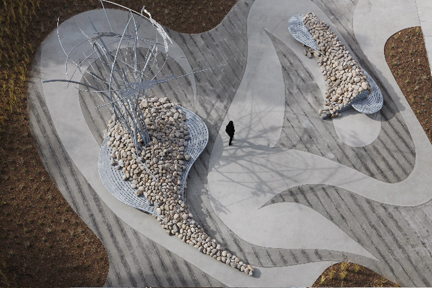 Text from press release: At the center of Glassman's pond-shaped White Tail Plaza are two rock "islands" featuring integrated seating and a view of indigenous grasses and trees. Come twilight, the islands glow from within to become the plaza's illumination. A maelstrom of steel emerges from the larger of these islands and unwinds toward the sky evoking an aviary space. 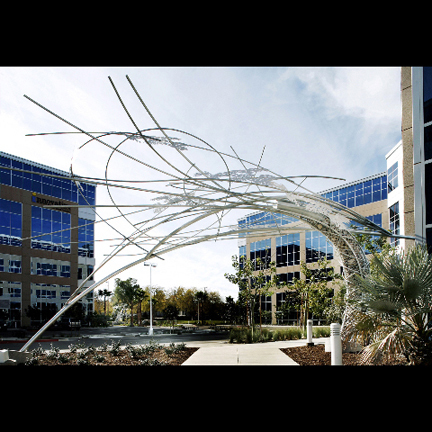 Across the parking lot just beyond the periphery, a third sculpture rises and arches over the campus sidewalks to create a corporate entryway. 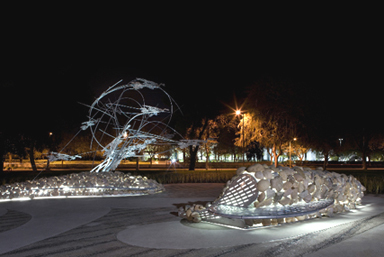 In total, the sculptures create a 4000-square-foot plaza by fusing forms from nature with steel and light. The weavings and unravelings suggest both natural and man-made systems. Woodland Hills was once riparian grassland -- the L.A. River originally ran through here before it was concreted and channeled away to make room for twentieth century development. This history and metamorphosis is memorialized in the work. White Tail Plaza is by design both contemplative and confrontational, and speaks to the complicated relationship between man and nature. White Tail Plaza is a public/private commission of LNR Property Corporation (http://www.lnrwarnercenter.com) and the Los Angeles Department of Cultural Affairs(http://www.culturela.org). About the artist: Stephen Glassman has worked in many diverse venues and mediums over the past 29 years including Paris Opera, Moscow Circus, Santa Monica Museum of Art, White Columns, and Artists' Space. His collaborators include Jonathan Borofsky, Philippe Petit, Sarah Elgart, and Oguri. His work caught international attention in the early 1990s when he began creating large-scale freeform structural bamboo installations in devastated urban sites around Los Angeles in the aftermath of the Rodney King Riots, Malibu Fires and Northridge Quake. These works became symbols of resiliency in their L.A. communities. 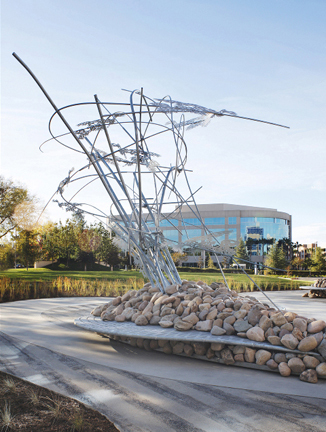 Recent and significant projects by Stephen Glassman include the Sylvia Campuan Bridge in Ubud Bali, SK8I80, sculpture for a Skate Park in Salt Lake City, UT, and Southeast Shear in Pine Bluff, AR. The Arkansas project, a NEA / Hillary Clinton White House Millennium Fellowship, was an 80' tall x 90' wide x 140' long freeform timber construction and plaza in this languishing Arkansas bayou city. Currently in production is the Soto Bridge project here in Los Angeles, as well as sculptures commissioned to debut over the coming year in Calgary, Canada; San Jose, CA; and Seattle, WA.